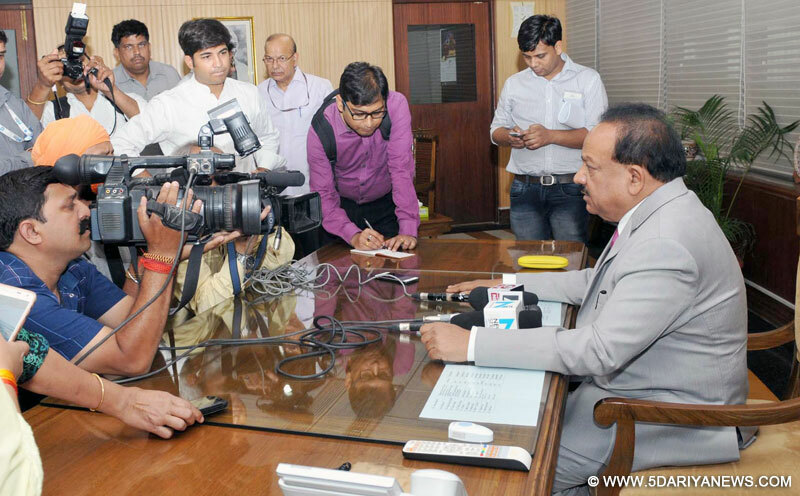 Dr. Harsh Vardhan interacting with the media after taking charge as the Minister of Environment, Forest and Climate Change, in New Delhi on May 22, 2017. Dr. Harsh Vardhan, Minister for Science and Technology and Minister for Environment, Forest and Climate Change, assumed charge at the IP Bhavan here today, following the sudden and untimely demise of former Minister of State (Independent Charge) Shri Anil Madhav Dave, last Thursday. He commenced his visit to the office by first planting a sapling in the memory of Late Shri Anil Madhav Dave in the premises of IP Bhavan. He felt humbled at taking over charge of the Ministry of Environment, Forest and Climate Change and recalled the contribution of Late Shri Dave as a great champion of river conservation and environment. He pointed out that Shri Dave’s love for children was evident in his belief to restore our environment for our children. “Dave ji did a great deal of work to protect our rivers, forests, ecosystem with the passion and the dedication of a true environmentalist”, he said. Dr. Harsh Vardhan recalled the words of Shri Anil Madhav Dave, who used to say, ‘If I can, so can we’. The Minister emphasised that the Ministry will always keep in mind the last wish of Late Shri Dave of environmental protection by planting, protecting and nurturing trees and of cleaning rivers and ponds. Dr. Harsh Vardhan reviewed the key areas of concern and priority with the Secretary and other senior officers of the Ministry. The progress of work in the last 3 years of this government and the key initiatives taken were discussed. He acknowledged that there are many immediate and complex issues of environment, forest and climate change, which will need collective and concerted efforts. He emphasised the mission of the government under the leadership of Prime Minister, Shri Narendra Modi, for integrating environmental concerns into development policies and programmes and balancing the two for India’s sustained growth and progress. For this, it was important for the Ministry to quickly adopt the latest technologies, re-engineer clearance processes and develop policy initiatives to further enhance transparency, accountability and timely delivery.The Minister focussed on policies and programmes for climate change adaptation andmitigation; biodiversity protection; pollution prevention and cleaner production; promoting circular economy for waste management through the concept of 4Rs (Reduce, Recover, Reuse And Recycle); eco-tourism; afforestation on degraded lands and disbursal of CAMPA funds to the states. In particular, he emphasised that “Pollution, both of air and water, is a matter of concern for the whole country, in general, and especially Delhi and NCR, and needs to be addressed on priority by the Ministry.” He also underlined that Climate Change and the commitments of India in the Paris agreement are another important challenge. He exhorted all the officers to continue to strive hard and meet these and other similar challenges in the coming years. He added that lot of good work has been done, which must be shared with the people. “Involvement of the people is crucial, and for protection and conservation of environment people’s participation has to be increased”, Dr Harsh Vardhan added.Earlier, Dr Harsh Vardhan took a round of the building, which is a benchmark in sustainable urban built habitat. The building is a net zero energy consumption building, as it generates all the power necessary on an annual basis. He expressed happiness at the clean environment, the open office concept and the overall ambience of the building.